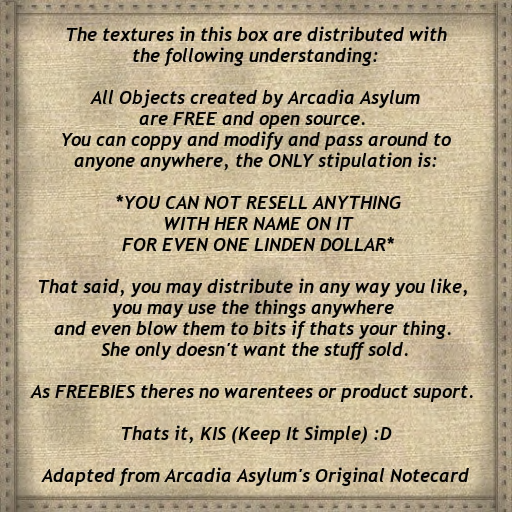 Arcadia Asylum's Mission ... "free" to do anything with except sell. I have never had a real problem with individual creatives who protect the intellectual property in their product: Just with those who want to regionalise the real world and the virtual worlds so they can force me to buy things twice or pay through the nose for it a second time in another place. In the real world this goes for software developers, record and book publishers, and film producers who have “regionalised” the world and licensed different markets even though with the internet there are no actual trade boundaries any more … or at least there shouldnt be. I should be able to buy a product (Film, CD. recording, e.book) anywhere and use it anywhere, without the problem of “regionalised” playback technologyor other manmade hindrances. In fact I feel the world’s consumers should boycott anything that prevents free use creative products once purchased … but, by that, I don’t mean illegal “replication” for sale. I know it is a hobby-horse of mine, but as a writer and a journalist of almost 40 years, I’ve written/worked so that people will read my work – and hopefully appreciate it – rather than to make money. I don’t mind even if others use parts of it as their own – in fact, I would consider it a compliment, in much the same way 16th and 17th Cenutry artists, writers and musicians did. For me immitation is the sincerest form of flattery. If someone can further an idea I have they should go for it. The same goes for my builds in Second Life and other virtual worlds, as meagre as they are. They are free to anyone who asks for them, but they cannot be sold. If I had wanted to be a scam artist selling the same thing over and over again to the same person I could have become a banker. A number of Second Life residents include in their profiles a parody of the Credit Card ( which shall be nameless) “Priceless” promotion. It goes something like this: Your membership of Second Life , Free; Your avatar skin and shape, $L5000; Your hair, $L1200; Your shoes, $L1000; Your avatar’s clothes, houses, boats, planes, animations etc, $L50,000; Linden Labs and Second Life own all your assets – you own nothing, Priceless! Yes that’s right, even though you make use of the pixels in your assets, and have bought and paid for them, you cannot legally take them out of Second Life or do what you like with them, even if they are labelled “full permissions”. 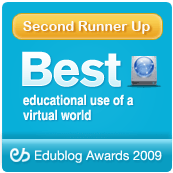 You cannot even back them up on your own computer, so you won’t lose them if Second Life closes down or there are glitches in the Second Life software… and there are plenty of those. 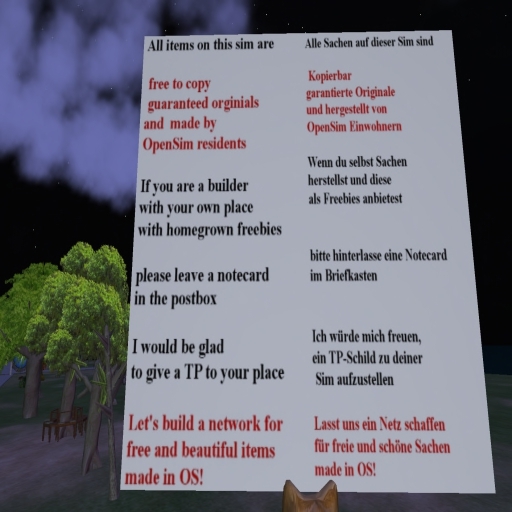 There have been those in Second Life who have fought against the Linden Terms of Service strictures over the years but most of them have come off second best or worse. 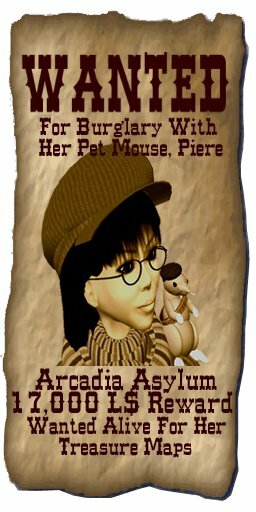 The first I knew of was Arcadia Asylum, a clever builder, now possibly dead in real life, whose works are remembered, adored and used and altered throughout Second Life and a myriad of OpenSim virtual worlds. The have possibly been exported/transported illegally – in the eyes of the Lindens – from Second Life via the reviled SL Copybot or viewers which at one time allowed export of legally bought full permissions assets. The Lindens have since made sure they have closed these loopholes. Her credo lives on in many virtual worlds. In Osgrid for instance Fred Huffhines, of wardrobe, wardrobe (131, 60, 48), has an enviable collection of Arcadia Asylum works among his magnificent.multi-storey Freebie Collection. His is one of the best Arcadia Asylum collections I’ve seen in any virtual world. Others in Osgrid who follow the Arcadia Asyulum credo, sometimes less, sometimes more, are those who distribute their wares at Wright Freebie Plaza under Creative Commons license, something I think all virtual world builders should use. There are too many of them to name here. Another who follows the Arcadia Asylum credo is Klarabella Karamell, of Freebie-Heaven, on Dorena’s World (OS vers 7, HG 1.5), who is putting together what is a burgeoning collection of “orginal” freebies for all virtual world users (picture of sign left) and seeking “original contributions from virtual world builders. There are others in Second Life today who stick with the Arcadia Asylum credo, like skin designer Eloh Elliott, who allowed her “$L6 million” products to be “uplifted” via LoL-Iota Heavy Industries, GmbH from the SL online shopping mall and used in any virtual world. The Lindens, however, have now curbed this activity – the “samples” are no longer freely available for evaluation – and made the task of distributing full perms freebies increasingly difficult. I have no doubt they will continue to do so as they attempt to close off their world from competition, particularly now Blue Mars looks to be going down the gurgler, and OpenSim activities are surging. The latest to recognise the inevitably of a myriad of virtual worlds needing transportable creative products that an avatar doesn’t want to buy twice is longtime, period piece and whimsical furniture builder and texture creator, Aamiene Despres (she is in the process of setting up websites, http://www.Purplepixiedesigns.com/ for SL stuff; and http://www. blackcatsgraphics.com/ for her freelance/contract graphic work) of Purple Pixie Designs (formerly known as XoticKreationS). Aamiene Despres … her textures will travel. My hope is that one day it will be normal to transport one’s assets between Grids. As I’ve said before I don’t mind paying once. I do mind paying twice or three times for the same item.